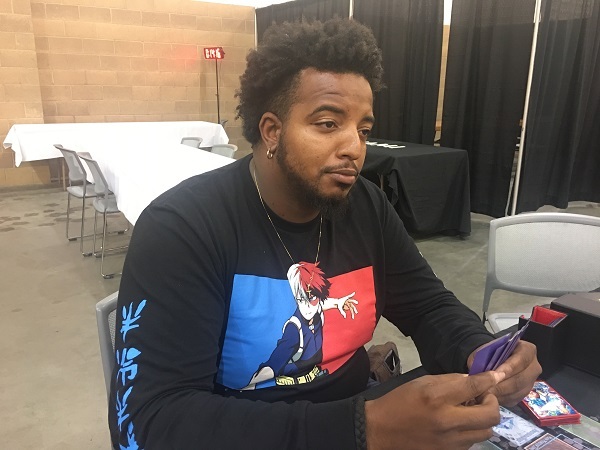 Niya Carter from Tujunga, California is currently 5-1 at YCS Pasadena with a Zombie Deck built around the cards in Structure Deck: Zombie Horde. Unlike most Zombie Decks you may be familiar with, Carter’s Deck relies on Zombie World to capitalize on the effects of his strongest monsters. To pull together his strategy, in addition to Doomking Balerdroch, he’s using Necroworld Banshee and Glow-Up Bloom from Structure Deck: Zombie Horde. Now, he’s Dueling against Daniel Rangel from Phoenix, Arizona in this Round 7 Feature Match! Rangel is using a Sky Striker Deck. Will the tried-and-true Sky Striker strategy prevail in this Feature Match, or will Carter’s innovative Zombie Deck be able to take the victory. We’re about to find out. It’s time to Duel! Rangel chose to go first and started off the Match by Normal Summoning Sky Striker Ace – Raye. He sent it to the Graveyard to Link Summon Sky Striker Ace – Shizuku and then Set 2 cards to his back row. In the End Phase, he used Shizuku’s effect to add Sky Striker Mobilize – Engage! from his Deck to his hand. Carter opened up Duel 1 with Uni-Zombie, Shiranui Solitaire, Rivalry of Warlords, Glow-Up Bloom, and Ash Blossom & Joyous Spring. He drew Call of the Mummy for his turn and then activated it. He activated its effect to Special Summon Shiranui Solitaire from his hand and then activated its effect to Tribute it and try to Special Summon a monster from his deck; but Rangel activated the effect of Ash Blossom & Joyous Spring from his hand to negate its effect! Carter Normal Summoned Uni-Zombie next and activated its effect, but lost out to Infinite Impermanence. He Set Rivalry of Warlords before ending his turn. Rangel activated Sky Striker Mobilize – Engage!, and Carter discarded Ash Blossom & Joyous Spring from his hand to negate it. Next, Carter flipped Rivalry of Warlords. In spite of that, Rangel used Shizuku as a Link Material to Summon Sky Striker Ace – Kagari and used Kagari’s effect to add Sky Striker Mobilize – Engage! to his hand. He activated Engage to add Sky Striker Mecha – Widow Anchor from his Deck to his hand and then attacked Uni-Zombie with Kagari to destroy it. In Main Phase 2, Rangel used Kagari to Link Summon Shizuku. In his End Phase, he added Sky Striker Airspace – Area Zero from his Deck to his hand with Shizuku’s effect. 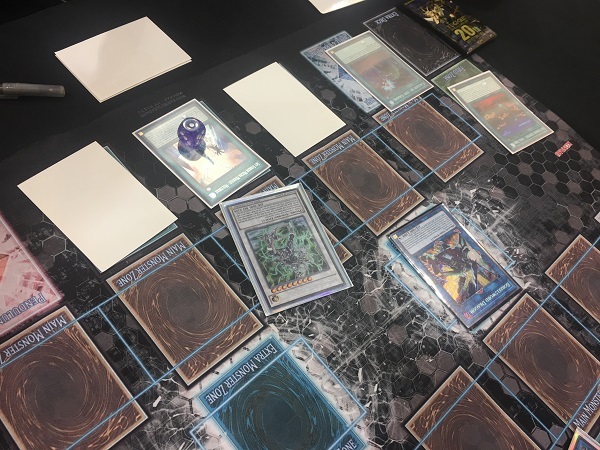 Carter drew Gozuki next turn and tried to activate the effect of his Call of the Mummy; but Rangel used the effect of the Ghost Ogre & Snow Rabbit in his hand to destroy it. Instead, Carter Set Glow-Up Bloom and ended his turn. Rangel activated Area Zero and used its effect to add a Sky Striker Mobilize – Engage! from the top of his Deck to his hand and destroy his face-down Metalfoes Fusion. He used Engage to add Sky Striker Mecha – Shark Cannon to his hand and then destroyed Bloom and Rivalry. Rangel banished the Bloom to use its effect and add Vampire Fraulein from his Deck to his hand. Carter used Shizuku to Link Summon Kagari and used Kagari’s effect to return Engage to his hand. He used Engage to add Sky Striker Mecha Modules – Multirole from his Deck to his hand and draw a card, and then activated his Multirole. He attacked directly with Kagari, and Rangel Special Summoned Fraulein from his hand in Defense Position. Kagari attacked Fraulein, and then Rangel flipped Widow Anchor to take control of Fraulein. Kagari attacked directly for 2000 points of damage, dropping Carter down to 5700 Life Points. In Main Phase 2, Carter used Multirole’s effect to send Fraulein to the Graveyard. Then, he shuffled Metalfoes Fusion from his Graveyard back into his Deck to draw a card. He Link Summoned Shizuku next, and then Set Widow Anchor from his Graveyard with Multirole and added a Widow Anchor from his Deck to his hand with the effect of Shizuku. Carter drew Gozuki and then activated Instant Fusion. He paid 1000 Life Points to Special Summon Thousand-Eyes Restrict from his Extra Deck and used its effect, but Rangel Chained Widow Anchor to negate its effect. Carter then used Thousand-Eyes as a Link Material to Summon Linkuriboh and then Normal Summoned Gozuki. He activated Gozuki’s effect, but lost out to Ash Blossom & Joyous Spring. Rangel Set a Widow Anchor from his Graveyard with Multirole in the End Phase. Carter used Area Zero to add another Multirole to his hand and destroy a face-down Terraforming and then activated a Widow Anchor, targeting Gozuki. He Chained another copy of Widow Anchor, targeting Linkuriboh, and then Chained Shark Cannon to Special Summon Vampire Fraulein. He took control of the 2 monsters targeted with Widow Anchor and then Link Summoned Borrelsword Dragon by combining all of his monsters! He used Multirole to send his Area Zero to the Graveyard and then used Area Zero’s effect to Special Summon Raye from his Deck. Raye attacked directly, and then Borrelsword attacked directly twice by switching Raye into Defense Position with its effect, wiping Carter’s Life Points down to zero! Daniel Rangel wins Duel 1 with his Sky Strikers! 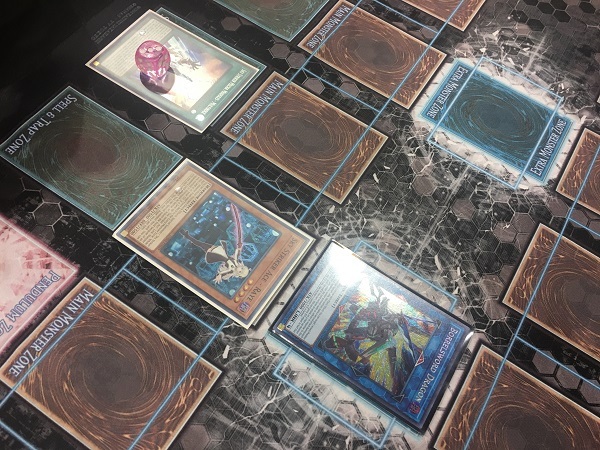 Carter opened up Duel 2 with Uni-Zombie, Mezuki, Shared Ride, and 2 copies of Gozuki. He Summoned Uni-Zombie and used its effect to discard Gozuki and send Mezuki from his Deck to his Graveyard. Rangel then Tributed Artifact Lancea from his hand to prevent cards from being banished for the turn, and Carter Set Shared Ride before passing. Rangel drew a card and then entered his Battle Phase. He activated Evenly Matched, and Carter simply Chained Shared Ride, activating its effect before banishing it face-down. Carter activated Sky Striker Mecha Modules – Multirole in Main Phase 2 and Set a Metalfoes Fusion. He sent the Fusion to his Graveyard with Multirole’s effect and then shuffled the Fusion back into his Deck to draw a card. He Summoned Raye next and used it to Link Summon Shizuku. He Set a card to his back row and then added Engage to his hand in the End Phase with the effect of Shizuku, allowing Carter to draw a card with Shared Ride. Carter activated the effect of his Uni-Zombie to send Necroworld Banshee from his Deck to his Graveyard and then discarded Gozuki from his hand to use Uni-Zombie’s effect and increase its Level. He then activated Gozuki’s effect and banished Mezuki from his Graveyard to Special Summon Doomking Balerdroch from his hand. He Normal Summoned Mezuki next, and then combined Uni-Zombie and Mezuki to Link Summon Vampire Sucker. He banished Mezuki from his Graveyard to Special Summon Gozuki to his field Linked to Vampire Sucker. He drew a card with the effect of Vampire Sucker and used Balerdroch’s effect to banish Shizuku. Rangel Special Summoned Raye from his Graveyard with its effect and Carter used the effect of Gozuki to send Mezuki from his Deck to his Graveyard. He banished the Banshee from his Graveyard next, activating Zombie World from his Deck, and then combined Vampire Sucker with Gozuki to Link Summon Summon Sorceress, which emerged on the field as a Zombie thanks to the effect of Zombie World! He used his Sorceress’s effect to Special Summon Zombie Master from his Deck. He combined Summon Sorceress with Zombie Master to Link Summon Firewall Dragon and then banished another Mezuki from his Graveyard to Special Summon Zombie Master. He then used his Zombie Master’s effect to Special Summon Goblin Zombie from his Graveyard in Attack Position and combined Goblin Zombie with Zombie Master to Link Summon Knightmare Phoenix. He discarded Uni-Zombie to use his Phoenix’s effect, and then destroyed Multirole with Phoenix to draw a card. He used his Goblin Zombie’s effect in the Graveyard to add Glow-Up Bloom from his Deck to his hand. In his Battle Phase, Knightmare Phoenix attacked Raye to destroy it. Firewall attacked directly next. Balerdroch attacked after that, and Rangel flipped Sky Striker Mecha – Hornet Drones to Special Summon a Token which absorbed the hit. At the end of the Battle Phase, with no other cards left on his field, Rangel activated Evenly Matched from his hand! Carter kept his Balerdroch on the field and banished everything else he controlled face-down. Rangel activated Sky Striker Mobilize – Engage! to add Sky Striker Ace – Raye to his hand and then Summoned it to the field. He sent it to the Graveyard to Link Summon Sky Striker Ace – Hayate and attacked directly with Hayate. He used Hayate’s effect to send Sky Striker Maneuver – Afterburners! from his Deck to his Graveyard. Next, he Link Summoned Kagari and used Kagari’s effect to return Engage to his hand. He activated it to add Sky Striker Mecha – Widow Anchor to his hand and then used another Engage to add Sky Striker Mecha Modules – Multirole to his hand and draw a card. He activated Multirole, then activated Sky Striker Airspace – Area Zero. He Set a card to his back row and then used Area Zero to add another Multirole to his hand and destroy his newly Set Twin Twisters. He activated the Multirole, sent it to the Graveyard with his other Multirole, Link Summoned Shizuku, and then used his Shizuku’s effect to add Shark Cannon to his hand. He activated Shark Cannon to banish a card from Carter’s Graveyard and then Set Engage, Shark Cannon, and Hornet Drones to his back row with Multirole. Carter drew Droll & Lock Bird. He attacked Shizuku with Balerdroch and Rangel flipped Widow Anchor to negate its effect and take control of it. In Main Phase 2, Carter Normal Summoned Glow-Up Bloom. He sent it to the Graveyard to Link Summon Linkuriboh and then used his Bloom’s effect to banish it and add Vampire Fraulein from his Deck to his hand. Balerdroch returned to him in the End Phase. Rangel activated Sky Striker Mobilize – Engage! to add Sky Striker Mecha – Widow Anchor to his hand and draw a card and Carter activated the effect of the Droll & Lock Bird in his hand. Next, Rangel activated Hornet Drones and Chained Shark Cannon. He Special Summoned a Token to the field, and Special Summoned Vampire Sucker from Carter’s Graveyard. He Link Summoned Hayate next, and then Link Summoned Kagari. He used Kagari’s effect to return Afterburners to his hand and then combined all 3 of his monsters to Link Summon Borrelsword Dragon. He activated Afterburners to destroy Linkuriboh and then attacked Balerdroch with Borrelsword Dragon. Carter activated the effect of Fraulein in his hand to Special Summon it, and Rangel Chained Widow Anchor to take control of Balerdroch and negate its effect. Balerdroch attacked Fraulein, and Carter paid 800 Life Points to prevent his monster from being destroyed. Next, Borrelsword switched Balerdroch into Defense Position with its effect so that it could attack again, and Borrelsword attacked Fraulein. Cater paid 1300 Life Points to use Fraulein’s effect and gain 1300 DEF to protect it once more. In Main Phase 2, Carter used Multirole’s effect to send Balerdroch to the Graveyard. He Set a card to his back row and then Set Widow Anchor, Engage, and Multirole from his Graveyard with the effect of his Multirole. Carter drew Uni-Zombie and Normal Summoned it. He used its effect to try to send a card from his Deck to his Graveyard, but Rangel flipped Widow Anchor to negate its effect. He declined to take control of the Uni-Zombie. Next, Carter combined his 2 monsters to Synchro Summon PSY-Framelord Omega. Rangel drew a card and when Carter used Omega’s effect in the Standby Phase, Carter used Widow Anchor to negate its effect and take control of it. Omega attacked directly, and when Carter tried to Special Summon Fraulein from his hand, Carter Chained Called by the Grave to banish a Fraulein from the Graveyard and negate the effect of the Fraulein Carter was trying to Summon so that it wouldn’t make it to the field! An attack from Omega followed by 2 attacks from Borrelsword dealt more than enough damage to wipe out the rest of Niya Carter’s Life Points! 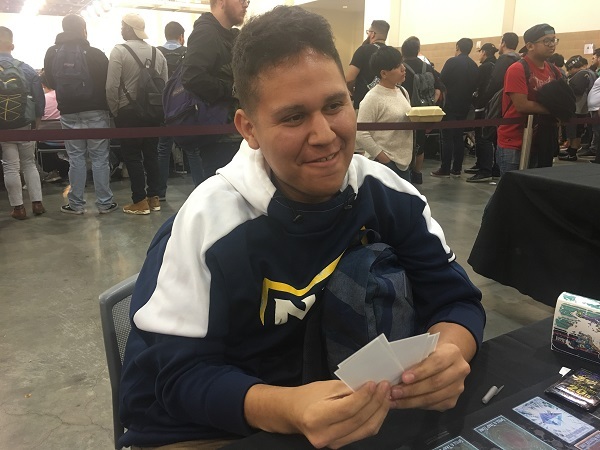 After Niya Carter gets devastated by Evenly Matched, Daniel Rangel manages to take the victory to advance with a 6-1 record using his Sky Striker Deck!